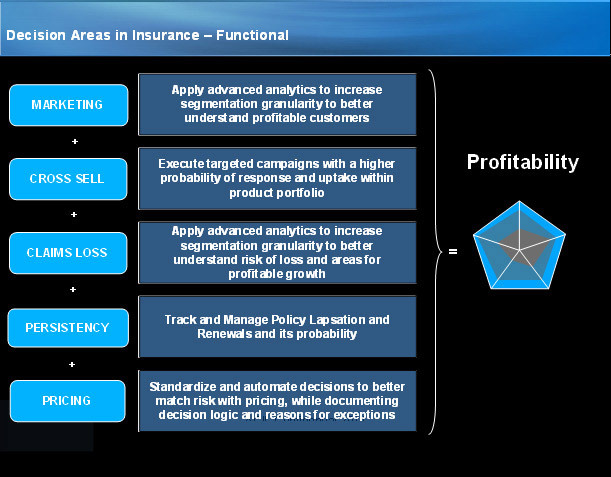 Decision Management and Analytics in General Insurance. AxionConnect helps general insurance companies to develop analytical frameworks using a wide range of statistical application to solve complex business problems in its customer management lifecycle. Using advanced cross sell and UP sell models, Insurance companies can optimize the use of low cost channels and target the right customer with the right product. With recent observations and appeal from IRDA to insurers on product miss –sells, there is a certain impact on attrition. Our simple and practical solutions assist in putting a data driven selling process in place. Using a overall customer contact management framework, AxionConnect assist insurance companies to effectively manage retention programmes using advances segmentation and predictive models. With different treatment to traditional and ULIP linked products organizations can optimize our knowledge in using advanced analytics. Higher incidents of non normal (Fraudulent) claims impact the complete underwriting fundamentals and product policy. AxionConnect can allow insurance companies to have deep insights into the claims profiles and identify and predict outliers for business teams to save millions in claims. Business can use advanced modeling techniques to automate the issuance of policies with straight through techniques. Unlike the traditional stochastic way of calculating loss and provisioning capital, AxionConnect helps insurers to significantly predict adequacy using stastical models. Third party channels are very key sales arm of any insurer. Their behavior and profiles determine the product they are likely to suggest to customers. a deeper understanding of these profiles allow insurers to design more robust agent on boarding and product selling strategies. Unlike the traditional stochastic way of calculating loss and provisioning capital, AxionConnect helps insurers to significantly predict adequacy using stastical models. AxionConnect can assist business teams with frameworks to assist the likelihood of premium collection with multiples channels. This will allow organizations to plan the gap and leverage resources appropriately to sustain topline. Unlike the traditional stochastic way of calculating loss and provisioning capital, AxionConnect helps insurers to significantly predict adequacy using stastical models. AxionConnect will assist insurers to intelligently leverage and hire third party channels using a variety of variables to sustain bottom-line and increase revenue and reduce fraudulent claims. AxionConnect have developed frameworks using which insurers can determine the suite spot to price their process and increase conversions. This also helps them certain governance on discounting thereby helping business at product levels to maintain and measure profitability. ( Motor and Health).